The Derek Oyston CHE Award is presented from time to "a group or individual who has made an outstanding contribution to the aims and objectives of CHE". It has so far been presented twice: in 2009 in conjunction with GALHA, and in 2011 in conjunction with the LGBT Consortium. The awards are in memory of Derek Oyston of Gateshead, who left a very generous legacy to CHE. 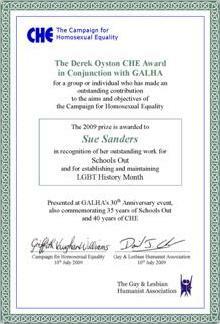 The first recipient was Sue Sanders, for her outstanding work for Schools Out and for establishing and maintaining LGBT History Month. The presentation, on Friday the 10th of July, 2009, was part of the 30th anniversary celebrations for GALHA (the Gay and Lesbian Humanist Association, at the Bishopsgate Institute, London. Accepting her award, Sue Sanders spoke of the enormous strides that had been made since the days when teachers could be sacked simply for being gay and commented. "I can't tell you how much it means to receive an award like this from the community". 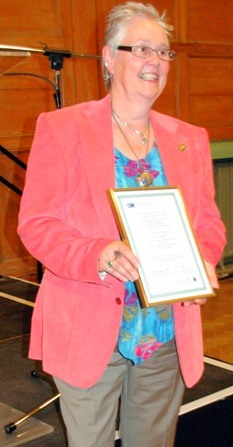 She also paid tribute to the work of the late Paul Patrick who had been co-chair with her of Schools Out. The award was announced by CHE Executive Member Griffith Vaughan Williams (left in the photo) and presented by CHE Vice-President, the well-known broadcaster Ray Gosling (right). The certificate mentions the 30 years of GALHA, the 40 years of CHE, and the 35 years of Schools Out, which has been campaigning for LGBT equality in education since it was established in 1974, as the London Gay Teachers’ Group. See also Schools Out's press release. 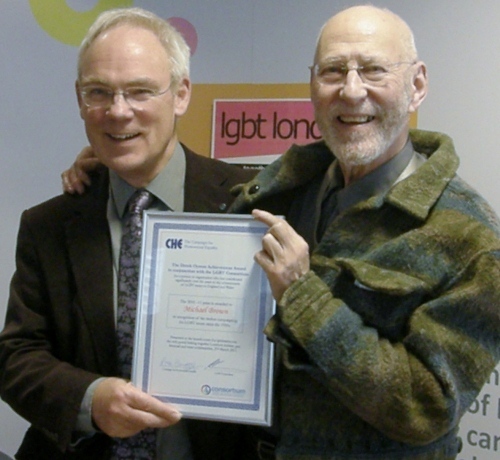 The 2010–11 award was presented in conjunction with the LGBT Consortium, and went to Michael Brown, veteran gay campaigner, shown below (right) with Ross Burgess, who presented him with the award. The presentation, on Tuesday the 29th of March 2011, took place at a Consortium event to launch the lgbtlondon.com website and the LGBT Pledge for London’s statutory providers. For more details see our Press Release, and a page of tributes to Michael Brown from people who nominated him for the award. See the video of Michael Brown's interview following the award. Copyright © Campaign for Homosexual Equality, 1999–2016. Last updated 21 Jul 2015.